I was tempted to call this “Blitz Your Pants,” but I’m an adult. I love finding writing prompts on Pinterest and Tumblr. You’ll find these great snippets of dialogue, like “You tried to kill me once. 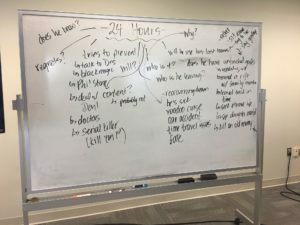 There won’t be a second time.” or interesting situations like “He showed up on her doorstep covered in glitter.” These things can get the imagination going and sometimes even spark an idea. You may also come up with your own seeds, sometimes with an idea for a character or a premise. Those always make me go “OOOH” and my imagination starts firing on all cylinders for about three seconds. Then my inner editor shows up and starts nagging that it hast o be JUST right. Thus, I (we?) find myself staring at these prompts, so full of potential, and stressing out because I’m trying to figure out the right answer. I don’t know if that’s conditioning from being in school, where we were trained to find the right answer, to say what the teacher wanted, or if it’s a drive to create something mind-boggling. In either case, I think trying to nail down the perfect answer gets in your way. You’ll spend so much time stressing about the perfect idea that some really great ideas will pass you by. Let me just insert an acknowledgement here. I am a massive hypocrite. I’m guilty of staring at an open Word document until my eyes burn because I have to get it JUST RIGHT. And usually, I have to kick myself and do this instead. I’ll write down a bunch of ideas, go walk around the house, and then come back. This is easy to do when you’re not committed to a project, when you don’t have “skin in the game” yet. When you’re in the middle of a story and doubting yourself, it’s much harder to let go. I get it. Try it anyway. So here’s how it works. 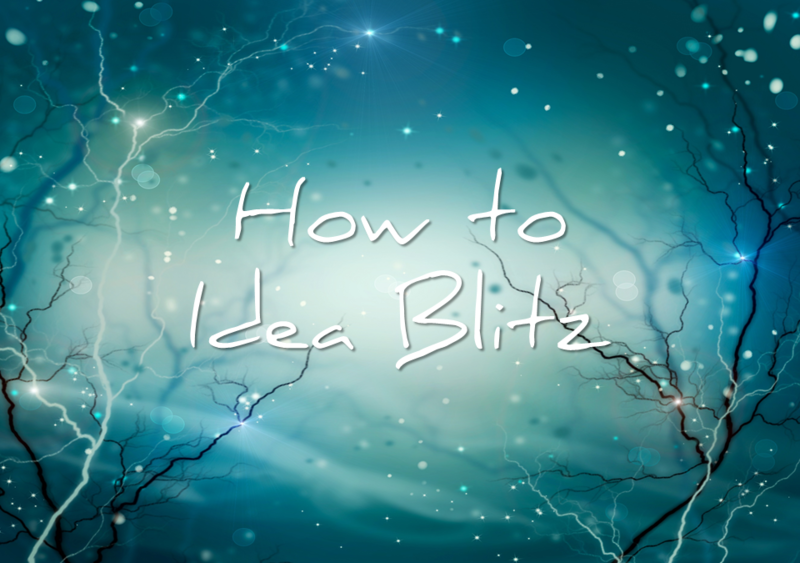 With an idea blitz, you’re going to take a prompt or your own idea, and you’re just going to play with it. I’ve done this on a white board, on a fat stack of index cards, or even just scribbling in a notebook. (It’s back to school time – go buy about 20 of those cheap spiral bound notebooks for a quarter apiece and use them for this.) I like to type sometimes, but I really like doing an idea blitz on paper because it becomes more of a mind map, and I’m not constrained by the linear construct of a word processor. It can be a woman. You do you. Which one of the ideas is right? I don’t know, which one do you want to write? Often when I do this with other people, I throw it up there and then ask “What questions do you have?” And EVERY. SINGLE. TIME. people will come up with so many great ideas that never crossed my mind! Our unique combination of ingredients (experiences, traumas, interests, books we’ve read, people we’ve met, etc.) will guide us to prioritize different things or view things in different ways. The number one rule for this is not to judge your ideas as bad or good. Just keep pursuing threads that interest you. When I teach this, I’m always afraid of making someone think their idea isn’t good, but time constraints being what they are, I usually pick one or two threads and follow them deeper. But the rule is still the same. All these ideas are neutral. Just keep playing! WHY DOES HE HAVE TWENTY-FOUR HOURS TO LIVE? WHAT WILL HE DO TO FIGHT IT? It was SO interesting to get the perspective of people who write different genres. For instance, you could turn this into contemporary fiction in which a man finds out he has late stage cancer that has never caused complications, and he’s likely to die in the next day. Therefore, he spends his last day mending rifts with his family and imparting the wisdom he’s gained through his life, culminating with attending his daughter’s wedding, symbolizing forgiveness for being estranged for most of her life. Alternately, you could write a tense, fast-paced sci-fi story about time travelers. This guy has been a time traveler, and by altering the past, has caused a chain of events that will result in his death in twenty-four hours. Now he’ll have to find the first domino in the chain and go back to fix it, but will he make things even worse? Or, you could have a dark paranormal in which a man tries to make a deal with the Devil to give him more time. This might a bad man who’s willing to do awful things to live a little longer, or a very good one who’s desperate to stay alive to protect someone he loves. 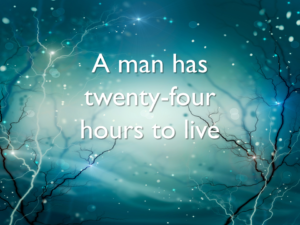 What are the conditions of his deal, and will he get trapped into a fate worse than death? None of these is correct. You’re not trying to earn brownie points from the teacher here. I just wrote an interesting little hook. It’s up to you how you play with it. But you can only do this if you’re willing to play a little. Write in pencil. Give yourself freedom to go down the paths that interest you, and if you dead-end, then back up and try something else.